Get a feel for Mountain Living in the Exquisite Cabin with a View! It's here! The cabin that has everything you could imagine for that unforgettable vacation in the mountains is HERE. 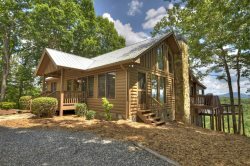 Come grab a piece of mountain life in this exquisite 3-bedroom abode. Adorned beautifully with plush furnishings and tasteful decorations, Point Of View is sure to impress. Join your guests as they are wowed by the view and all around tranquil setting this mountain home offers. With your convenience in mind, the kitchen is fully equipped for preparing culinary masterpieces - vacation style! The dining area is cozy, yet spacious... and perfect for entertaining. No home would be complete without a living room to lay back and relax as you watch your favorite shows or movies. When the timing is right, challenge your companions to a friendly game of pool in the roomy, lower level den. This level also offers a comfortable seating area perfect for watching the big game and having a hangout session. If you're more of the outdoorsy type, create a fire in the outdoor fireplace and watch some TV while you do! Spent your day shopping or hiking? We know that hot tub is calling your name - soak all of your worries away under the mountain sky any time of day. When night time comes around, finding the perfect place to lay your head has never been easier. Three separate levels, with a bedroom on each, offer optimum privacy and comfort. Each bedroom has a corresponding bathroom for your convenience. This is the vacation you need to make happen - Come Enjoy our Point Of View! The staff was very professional and answered questions via email and by telephone quickly. They kept you informed and provided great details. The cabin was very spacious, clean, up to date and the layout was perfect for 6 adults. I really had one of the best birthdays celebrating at this cabin. I will defiantly be going back again. For the past 3 years we have had the experience of working with your staff and there has not been one time that we did not receive an immediate response from an email. This is the number one reason we continue to reserve with Southern Comfort Cabins, I believe that customer service will keep people coming back when they have had the experiences that we have had. Point of View was the right cabin for our family. The location, size and amenities were top notch. Loved being able to have an outdoor fire to make smores. So comfortable and well decorated. Felt like home. One week is not enough time. Planning for two weeks next year. Would stay there again in a minute! Very friendly nd informative upon check in. We did use our gps to find the cabin, but you can not get there from the gps instructions....we read that after the fact! We were told to use the written instructions, so that was on us, not the gal at checkin! We had the best time ever..the weather was gorgeous, the cabin magnificent and the company we were with....top notch. We cooked at home for the 2 evenings and enjoyed the time cooking, visiting and of course the views! We will be back! This is NOT a pet friendly property - Owner does bring pets and extra efforts are taken to clean property - Persons with sensitive allergies should take note. Two towels (Body, hand, hand) per person will be left out for use.